Anytime Chambeyronia unfolds its leaf, it is a guaranteed showstopper. I have several of them, but this particular one is the most colorful so far. Its total hight is only 50 in (127 cm), growing under direct sunlight from late morning on. One pic, light through, another light on. 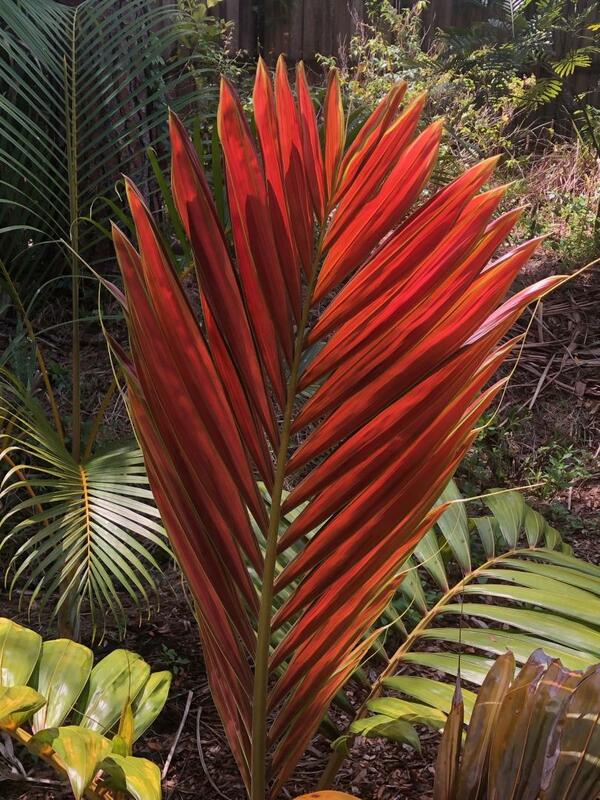 Beautiful palm. Hookeri usually isn't that colorful. Chambeyronias do well here. Interesting...My experience is that hookeri's produce the best reds. Sun and heat definitely have an impact. Agreed...hookeris are deeper red than macrocarpa in my yard. Usually, it is the case with hookeri. But there are exceptions too. I have a hookeri that doesn't want to develop vivid color. Here both are for comparison. The leaves have opened on the same day. Still a beautiful palm! wow! I just bought a couple of these. I'm glad I did after seeing yours. You can't have too many of them! I have found Hookeri to be slower and less robust than standard macrocarpa. I have both in my back yard that I planted as young seedlings. My only mortalities have been Hookeris. The macrocarpas all grew faster and larger. Knowing what I learned by experience I would not plant the two varieties together so I germinated seeds of Hookeri and planted a couple of those seedlings on the west side of the house away from macrocarpa competition. Must be climate... In SoCal, hookeri is by far the fastest of my Chambeyronias. Good thought. I wonder if Hookeris tend to be higher altititude palms that have a harder time dealing with FL summer nightly swelter for 6-7 months. 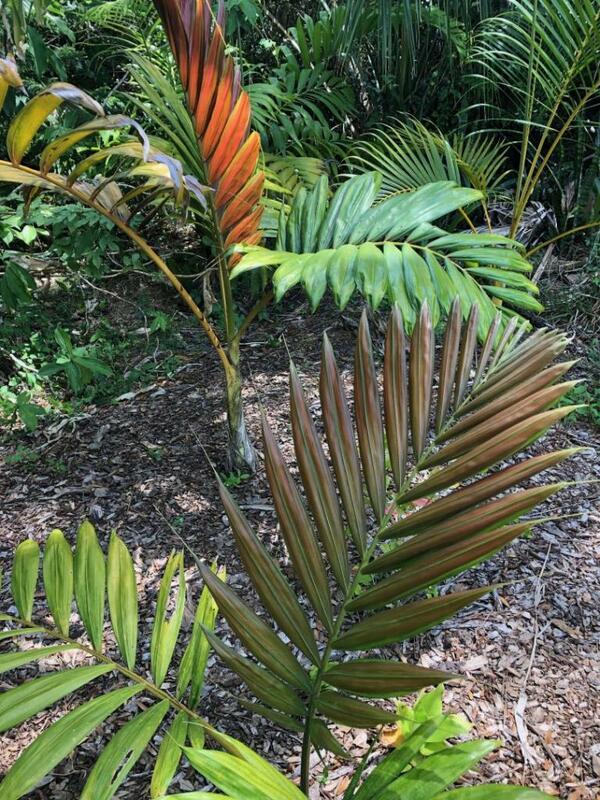 I would love to try C. lepidota but haven't dared because it is a mid-level elevation palm. It could be summer heat. I have a Hookeri that I bought as a bare-rooted 1 gallon seedling, shipped to me from MA. I also bought 3 slightly larger Macrocarpa palms locally at about the same time last summer. The 3 Macrocarpa are consistently growing (even during winter) and all 3 opened new bright red fronds in February. 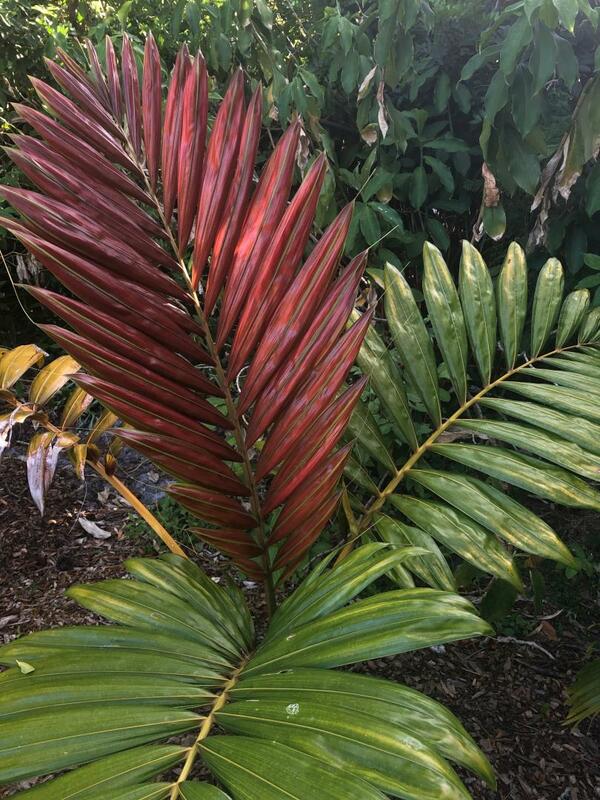 The Hookeri just sat there looking unhappy for the last 7 months, and *finally* opened a new small frond 2 weeks ago, with no red color. It might not have liked being bare rooted for shipment, doesn't like my soil mix, or maybe Hookeri just isn't happy in FL. If it's the latter then I might just toss it and stick with Macrocarpa.